Life is indeed complex, but no more complicated than we make it. 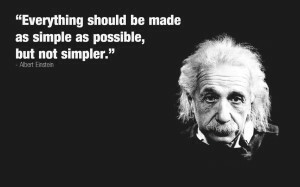 Albert Einstein believed in simplicity and I recently found myself poring over a collection of Einstein Quotes. Afterwards, I found the following short list of Simple Rules buzzing around in my head. Of course there is an infinite number of possibilities; these simply worked for me. You will no doubt come up with your own. Embrace ongoing learning. Opportunities for learning abound in every situation, interaction and conversation. Pay attention and seize what is right in front of you. It will enhance and contribute to your own breadth of experience and expertise. Persistently exercise your creativity and imagination. Imagination is fundamental to integrating experience, learning and doing. When coupled with creativity, new, valuable and wonderful things will emerge from your efforts. Inspire others to imagine along with you. Value people. Recognize, respect, believe in and care about others. Not only will you get the same in return. Be someone who appreciates and is appreciated by others. Do what is right. ‘What is right’ means what is right for you. Be true to yourself and stand firm in your convictions. Then they will always be there to guide you. Be unconventional. Everyone talks about thinking/acting “outside the box.” If you do what’s always been done, you’ll get what’s always been gotten. Think, act and BE different. That is the path to discovering your own answers – and more importantly – your own questions.